We recently participated in the 6th Annual Pink Ribbons for Life event in our hometown of Orlando, Florida. 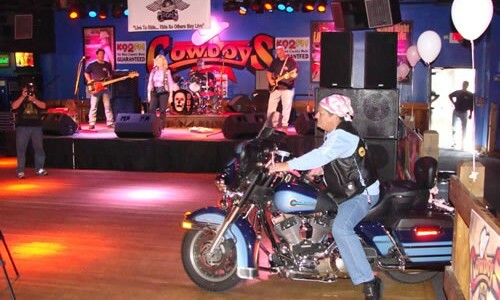 It was held by The Chrome Angels of Central Florida, an independent motorcycle riding association made up of women brought together by their love of riding and their desire to make a positive impact in the community. Their primary goal is to support breast cancer research and to help victims. Sunday, January 18th at 11:30 in the morning, hundreds of bikers on an array of different motorcycles spilled into the parking lot. They came in shifts that began at 4 seperate locations, all riding for one reason…to raise money for breast cancer research! There was some great local country music, fabulous BBQ food, awareness exhibits, art, raffles, a silent auction, and some very awesome games. One game in particular, Laura Savageau (one of our fabulous volunteers) and I participated in. It involved the women putting a blindfold on and a plunger between their legs and the men putting toilet paper between their legs. Then the girls had to jump to us, hook the TP onto the plunger using no hands and hop back to the other side with it…Wow! Well, I don’t know if we should be overly proud to announce this but we won!! Got a gift certificate to eat some more BBQ to prove it. Anyways…I couldn’t help but think, “What a unique crowd full of interesting characters who were all equally touched and deeply affected by this cause.” After all, I had never thought of breast cancer awareness to be synonymous with rugged riders. However, it’s moments like these when I really grasp how many people cancer affects. It’s moments like these I remember how important it is to give anything and everything to find better treatments, therapies and support. It’s moments like these where I really feel the camaraderie between all who are affected in some way by this disease. I encourage you to check out this great local organization and get a feel for the people behind its unique voice. They are working incredibly hard to raise money for breast cancer research and improve the quality of life for all who are affected. I am happy to now call them friends!